In recent months, the prospect of a mahagathbandhan (grand alliance) of Opposition parties presenting a united front against the BJP has sparked widespread speculation that Prime Minister Narendra Modi will be ousted in the general election in May. The Congress’ victory in three state elections — Rajasthan, Madhya Pradesh and Chhattisgarh — has greatly improved morale, leading some of its stalwarts to predict anything from 120 to 150 seats in the Lok Sabha election. That would enable it to come to power at the head of an anti-BJP coalition. Alas, Congress president Rahul Gandhi’s chances have just been skewered in Lucknow, even as Bahujan Samaj Party (BSP) leader Mayawati’s have soared. The Samajwadi Party (SP) and BSP have unceremoniously dropped the Congress from their alliance in UP for the coming general election. They will contest 38 seats each, and offer two seats to other allies, possibly to Ajit Singh’s Rashtriya Lok Dal (RLD). They will field no candidate in Rae Bareli and Amethi, the constituencies of Sonia and Rahul Gandhi respectively. Bereft of support from the SP or BSP, the Congress may win only two of UP’s 80 seats, India’s largest state. That will make it difficult for the party’s total Lok Sabha tally to reach even 100 out of a total of 543. What has happened? Many regional parties that fear the BJP are also contemptuous of the Congress. They may hate Modi, but snigger at Gandhi, notwithstanding his recent state election victories. They have no desire to become Gandhi’s minority partners. They want to be in the driver’s seat themselves. The SP-BSP combine will probably back Mayawati for prime minister in New Delhi, and Akhilesh Yadav for chief minister in UP in the next 2022 state election. That division of power will satisfy the ambitions of both. The combine hopes to win over 60 of the 80 parliamentary seats in UP. Arithmetical calculations show that the two parties combined got more votes than the NDA in 41 of the 80 constituencies in 2014. Their combined share in the 2017 UP state election exceeded that of the NDA in assembly seats adding up to 57 of 80 parliamentary constituencies. If anti-incumbency lowers Modi’s vote share further — which is possible but by no means certain — the combine hopes to win far more than 57 seats. That will make it the largest group in Parliament among the regional parties, well positioned to bid for the top job. 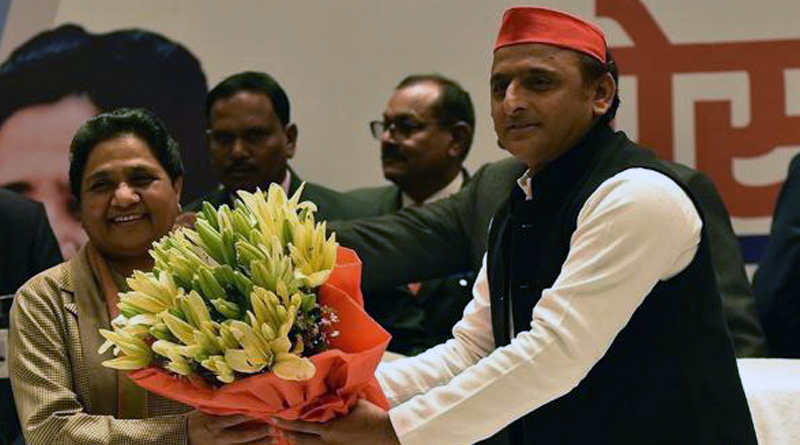 In the past, all talk of an alliance between the BSP and SP was fanciful. In 1995, state legislators of the SP, then led by Mulayam Singh Yadav, attacked a hostel where Mayawati was staying, and allegedly might have killed her but for the intervention of a courageous junior police officer. Mayawati has never forgiven Mulayam Yadav for that, and hence any alliance between the two was impossible. But before the last state election, Akhilesh Yadav mounted a palace coup to oust his father from power. Mayawati must have loved that spectacle. She could never ally with Mulayam, but is happy today to ally with Akhilesh. The SP hopes to get most backward caste votes, and Mayawati hopes for most dalit votes. They think upper caste votes will be split between the BJP and Congress, weakening both and ensuring their defeat. In the 2017 state election, the Congress was an ally of the SP, which gave it as many as 105 of the 403 seats to contest. But the BJP swept the state, winning 312 seats. The Congress won only seven. The SP has concluded that the Congress is both weak and unable to transfer its votes to allies, and so is not a useful alliance partner. Mayawati agrees emphatically. The Congress cannot be written off. It still has strong regional allies in Bihar, Karnataka, Tamil Nadu, and maybe Haryana. But the big regional parties in West Bengal, Odisha and Telangana will be happy with a non-BJP, non-Congress government in New Delhi. That now looks more likely than a Congress-led coalition government. Earlier this month, I had written that predicting elections was impossible, but predictions were now seen as fodder for evening gossip, not as serious exercises in accuracy. In that spirit, I gave Modi a 10% chance of winning on his own, and a 40% chance of heading a disparate coalition. I put the chances of a Congress-led coalition government at 30%, and of a Third Front government at 20%. After events in UP, Modi’s total chances remain at 50%. But the chances of a Congress-led coalition government have slipped sharply to 10%. The chances of a Third Front government are up to 40%. The secondstrongest contender for prime minister after Modi is now Mayawati. Rahul Gandhi’s prospects look distant. This is not the final word. As election plans and alliances crystallise in other states, the odds of each scenario will keep shifting. Modi could announce a basic income for all low-income people, a scheme to build the Ram Mandir in Ayodhya, or launch ‘surgical strikes’ on Pakistan. He might be hit by a dramatic slowdown or recession in the global economy. Watch this space.